At 8:06 a.m. on December 7, 1941, Seaman First Class Donald Stratton was consumed by an inferno. A million pounds of explosives had detonated beneath his battle station aboard the USS Arizona, barely fifteen minutes into Japan’s surprise attack on American forces at Pearl Harbor. Near death and burned across two thirds of his body, Don, a nineteen-year-old Nebraskan who had been steeled by the Great Depression and Dust Bowl, summoned the will to haul himself hand over hand across a rope tethered to a neighboring vessel. Forty-five feet below, the harbor’s flaming, oil-slick water boiled with enemy bullets; all around him the world tore itself apart. In this extraordinary never-before-told eyewitness account of the Pearl Harbor attack—the only memoir ever written by a survivor of the USS Arizona—ninety-four-year-old veteran Donald Stratton finally shares his unforgettable personal tale of bravery and survival on December 7, 1941, his harrowing recovery, and his inspiring determination to return to the fight. Don and four other sailors made it safely across the same line that morning, a small miracle on a day that claimed the lives of 1,177 of their Arizona shipmates—approximately half the American fatalaties at Pearl Harbor. Sent to military hospitals for a year, Don refused doctors’ advice to amputate his limbs and battled to relearn how to walk. The U.S. Navy gave him a medical discharge, believing he would never again be fit for service, but Don had unfinished business. In June 1944, he sailed back into the teeth of the Pacific War on a destroyer, destined for combat in the crucial battles of Leyte Gulf, Luzon, and Okinawa, thus earning the distinction of having been present for the opening shots and the final major battle of America’s Second World War. 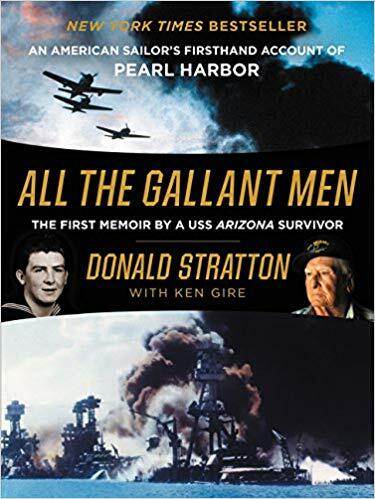 As the seventy-fifth anniversary of the Pearl Harbor attack approaches, Don, a great-grandfather of five and one of five living survivors of the Arizona, offers an unprecedentedly intimate reflection on the tragedy that drew America into the greatest armed conflict in history. All the Gallant Men is a book for the ages, one of the most remarkable—and remarkably inspiring—memoirs of any kind to appear in recent years. I love WWII books and stories, and All the Gallant Men is a really good one. I enjoyed how it was written, and how I am able to connect with the main character and his life in the military. I did like this book better than other war books as the author talks about the pre-war experience and his experience of being in the states and military hospitals during the war. I definitely recommend this book to any history or non-history lovers.